World Chef is a restaurant sim game from Social Point, and no it’s not like Cooking Dash, where you will have to be quick in serving dishes to customers. It’s a resource-management game, where you don’t have to dash around and dish out food to impatient customers, much like My Cafe. You can take your own time, prepare the most exquisite dishes and serve them to uncomplaining clients. As you progress, you will be able to expand your eatery and prepare world-class food for distinguished guests. It’s not a time management game so there’s no hurry to serve everyone, including the ones waiting outside your restaurant. But having more tables will help you serve more people at the same time. This way you will collect coins and XP (blue stars) faster. Just make sure you have ample space to place tables. If there isn’t any space left, then expand your restaurant by purchasing additional space using coins. To complete expansion, place tiles on the purchased empty space. Make sure you prepare those orders first that take less time to complete. Tap on each client’s table to know what food he/she wants and set your food priorities straight. Prepare those first that take less time to complete and quickly serve them to those clients who need them. Doing this will ensure your clients leave their tables for more clients. You may even request a client to leave a table before the coin icon appears above him. Tap on the table that you recently served and a then tap on “Free”. The Free button usually appears soon after the countdown timer hits one minute. Leaving the table early won’t have any effect on rewards. 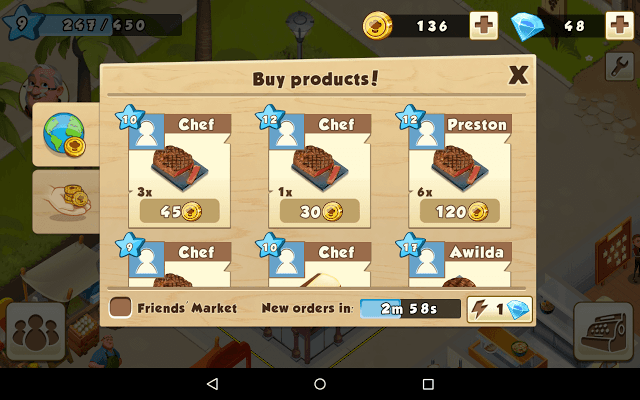 The social market is where you buy and sell food items and dishes to other players. Try to buy dishes instead of ingredients. You can easily purchase ingredients from the market, so you don’t need to buy them at the social market. Look for cheese and other products as well as main dishes that you will serve to your clients. Sellers will post dishes at competitive rates. Choose a dish that has a lower price tag than other dishes of the same type. However, most sellers sell a dish or ingredient at a maximum price. There might be a few sellers who may sell dishes at a discount, i.e. less than the max price of a dish. Keep an eye on such offers. New offers appear every few minutes. The timer at the bottom of the social market screen shows how many minutes are left before new orders start appearing. While selling dishes, sell those that you don’t need them or have in plenty. Also try putting those on sale that can be easily cooked, take less time to finish and fetch good money, such as Steak or Patties. I don’t think you should sell main dishes, unless you have an extra dish or two that you don’t need them or are in dire need of coins. If you are planning to sell main dishes, then I would recommend those that take less time to complete, such as hamburgers. You can make more hamburgers quickly than other dishes. Make some extra hamburgers and put them on sale. Try to sell more than one hamburger (or any other dish) as people tend to buy in bulk instead of just one or two dishes. If you want to sell them faster and are in need of coins, then you may offer a set of 5 or 10 hamburgers at a lower price than the prevailing social market price. Check the Buy section to know the price sellers are selling for hamburgers and other dishes. To remove an item that you have put up on sale, tap on it and then press the green button. You will need to spend gems to remove it. Want to change the interiors of your restaurant? Want to know how other players have designed their own restaurants and made the most of prime real estate? Be inspired by their designs and layout! Tap on the social market and go to the “Buy Products” section. Tap the profile pic on top of each food item. This will take you to the seller’s restaurant. You can get design and placement ideas visiting each player’s restaurant. You will know how to make the most of available space and how to make your restaurant aesthetically pleasing and appealing. To upgrade your ingredient and dish storage, you will need special items. You can get these special items from random customers or from the social market. Keep serving customers and who knows, some generous soul will give you an item that will help you upgrade your ingredient or dish storage. Keep looking for special items on the social market. Some sellers will sell unwanted or duplicate special items. Prefer upgrading the ingredient storage room first as you will need plenty of ingredients to make several dishes. It’s the ingredient room that will be crammed with food items. Serve clients to get XP. This is a no-brainer, but not all dishes give the same amount of XP. Some dishes give more. For example: A client ordering pizza will give more XP than a client ordering cheeseburger. Also, clients who order more than one dish give more coins and XP. Tap on a table to know what ordered dishes serve more XP/coins. Tap on the order chart which is located near the dish storage room. The order chart shows a list of orders and the reward they give. Tap on each table under “Orders” menu to check what clients want. Complete achievements. A completed achievement gives 20 XP and a gem. Tap on the chef’s statue to find an achievement’s requirements. Completing all achievements will upgrade a player to a new chef level and the player will receive an extra 20 gems. Keep your chefs busy. A dish gives you a few XP when you collect it from a chef. You can remove unwanted decorative items from the restaurant by long pressing on a decorative piece. Tap on the safe locker to store the item. If you want to place the decorative piece on your restaurant again, go to shop > decorations. To move tables and other objects placed on your restaurant, long-press a table or a chef/helper and then drag it to the desired area. 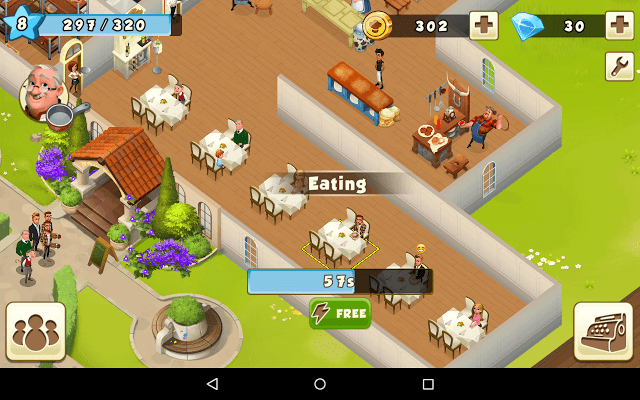 In World Chef, your grandfather’s friend will keep helping you, suggesting dishes that your clients want. Tap on the flashing icon to your left to get his cooking suggestions. How do I build walls on the updated version? It won’t let me like it used to in the beginning and I can’t figure out how to make it work? There’s a little arrow on the left side of the decorations bar where you can select the type of decoration. Select object type and you can pick walls in there. How to open the gem jar? Is full and cannot open up. You will have to buy the tip jar using real money when it’s full. Unfortunately, there’s isn’t a way to open the jar up to get those gems for free. So frustrated: I am on level 16 and there must be a glitch or something because it would not let me cook any food or take any food from the chefs. I can’t make any money because I cannot bring food to the tables because the food that’s already cooked will not let me bring to the tables. the chef that pops up and tells you that you have food done or tables that are ready to leave and pay won’t come up either I cannot do anything. I learned a trick – Don’t kick customers, just put table in silver safe storage and put the table back. This way you don’t have to wait 20 min on table to refresh.